It’s important for others to understand, one of the reasons this has worked so well is that you listen, understand the problem and help us do our work. I was struggling with a problem which seemed immense and in one short sentence in one short conversation, David completely transformed the way I was thinking about that problem and tackling it. I had tried every avenue and simply could not fathom an answer. Frankly, he saved me from insanity. I very much enjoyed listening to David’s thoughts on this absolutely fascinating topic. Each of David’s steps could provide a day’s seminar on their own. 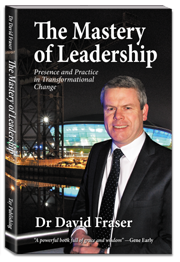 David provides an informative, practical, structured approach to this vital skill and area of leadership. His mastery of our question and answer session really brought the subject home on a practical level to the audience. David feels like one of the team. He has a great all round approach to things. He really understands people and business and knows exactly the right approach to get the best out of both. Nothing we have thrown his way has stumped him and everything we have thrown his way has improved considerably. Every business should have access to someone like him. From the feedback we have received to date it was a fantastic session enjoyed by everyone, with the only drawback being that it wasn’t long enough! I regularly use the phrase ‘people do business with people’ and David brought real life to these words. The thought provoking session gave our business club members insight into how mastery of relationships can be a real and tangible benefit for any business. Your session was great and a brilliant way to start the day. The take up of your book I think shows the impact you had with the audience… Thanks again for your excellent session. Your posts are thought-provoking, and I always read them. Your real strength has been mediation – getting people to talk to each other who wouldn’t do that naturally. I just don’t think we would have got there without you. Classic self-starter. Able to interpret what’s required, take board level responsibility and make it happen without needing further input, whilst coming forward with options when appropriate. I didn’t need to worry about it from one meeting to the next. Projected a company image without seeming to be biased. Created a win-win. The only one around with the skills to make this happen. David was instrumental in setting up the management board and programmes office at the Clyde Naval Base – a difficult task with many differing views on how best to achieve success. As a Director at this facility I found his support invaluable. Having just read David’s new book I now understand why he was so successful and I would highly recommend his work to anyone looking to improve business efficiency and effectiveness through improving relationships. 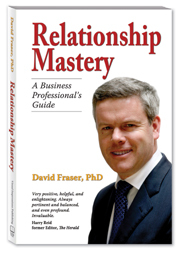 David Fraser is a compelling speaker who can convey complex principles with ease and clarity. We found his talks to be fun, interactive and memorable with plenty of practical tips and food for thought. Helped bring a discipline to the meeting, as well as help and facilitation. Made tremendous interjections at the right time, helped people reconnect with what they personally needed to do to make the project successful. Thank you for your talk. I found it very encouraging & thought provoking with areas of learning for all of us. Your talk was excellent and inspiring. Played the role of neutral and played it well. Listens. Very quickly gets the main thread – the nub of the problem. Never confrontational, at all. Points people in the right direction without getting their backs up (and there are some difficult characters). Very much helped keep things together. Things were destined to be difficult, but they weren’t difficult. An ability to focus on the key issue and avoid distractions. Safe pair of hands, implementer par excellence. David’s ability to analyse and understand complex practical, theoretical and political issues and the further ability to synthesise practical solutions is first class. Not afraid of tackling difficult situations. Orderly, measured and gets things done whilst maintaining a reflective and considered point of view. Only one we’ve got who can shape the front end of projects. The speech was perfect and hit all the right notes for the evening. A very talented and engaging speaker. I am sure I speak for the rest of the attendees in telling you this was a thoroughly engaging encounter.